VMware vSphere Client is a client tool to manage VMware ESX and its VMs. It’s a basic but essential tool I need to manage my Virtual environment. But when I tried to install it on my Windows 8 machine, this is what I got. Well, Windows 8 is above XP SP2, isn’t it? Not sure who to blame but I guessed that a workaround would be needed to get me over this silly error. This is how I solved this error. 1. Assume you already have the executable installation file, extract the content out of it to a folder. If you have 7Zip installed, you can simply right click the executable file, go to 7Zip, and choose Extract to folder name. 2. Go to the extracted folder, bin sub-folder, right click VMware-viclient.exe and choose Properties. 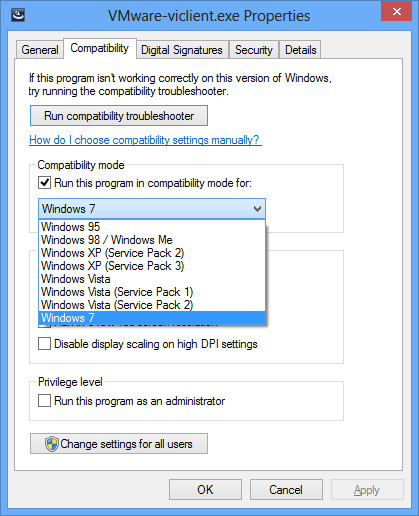 Go to Compatibility tab, and check the option “Run this program in compatibility mode for” and pick Windows 7 from the list. 3. click OK to save the setting, and launch VMware-viclient.exe to start the installation again. Woola... that’s the workaround that saved my day. It works on my vSphere 4.1 but according to here, it works on 5.0 as well.